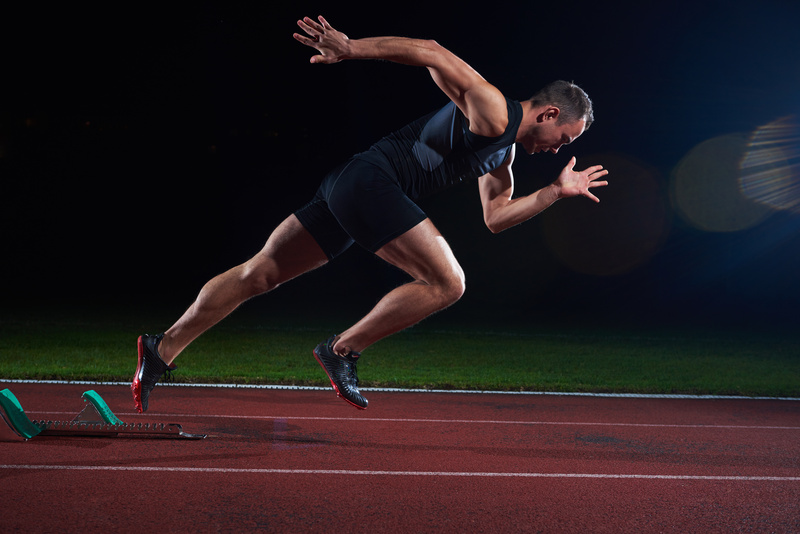 The following article written by Michael Boyle stresses the importance of the first 10 yards when it comes to being a faster athlete. Does It All Come Down to the First Ten Yards? I have always been a ten yard dash proponent. When we test speed, regardless of sport we test the ten yard dash. In fact, I wrote an article previously that questioned whether we really ever tested speed in most team sports. If we choose to be specific, what we really evaluate with tests like the 40 yard dash is acceleration. The best sprinters in the world accelerate for up to sixty meters. That means that each ten yard split continues to get lower up to sixty meters in a world-class sprint race. A forty yard dash is a test of acceleration ability, not speed if we want to get our physics right. The only athletes who actually ever run a forty yard dash are my NFL Combine or Pro Day athletes. Even these athletes only run the forty at the actual workouts. We never run a forty in training. In fact, over eighty percent of our training is done for ten yards, working to increase power and decrease steps. Less than twenty percent is done for 15-20 yards. In fact in over twenty years of training athletes for the NFL Combine I have never had an athlete run a forty yard dash prior to being tested by a pro scout. In spite of this, or perhaps because of this, my athletes have routinely tested well at the NFL Combine. Numerous years we have had the fastest athlete at a given position. My hesitance to run a forty prior to the Combine or the Pro day was based on a simple concept. If you are injured you can’t run the forty on the day that really matters. In the NFL evaluation process injuries at the wrong time can be career killers. One problem arises in this process. Athletes want to know what they will run in the 40. In order to increase the ability to project 40 yard dash times from ten yard dash times I have been closely studying the segmental breakdowns of the forty yard dash from past NFL Combines to see if there was discernable pattern. I analyzed the data to see if there was a consistent formula that could be applied. The results were surprising. It is important to clarify that initially the ten yard dash was the focus of our training primarily because the most frequent injury seen in athletes doing Combine or Pro Day prep work is a hamstring strain. In fact hamstring strains are the most consistent injury problem seen in sprinters. These hamstring strains are almost always the result of running repeat forty yard dashes in preparation for the testing. Curiously enough I have never seen a strain occur in a ten yard dash. The 10 yd dash is a great test that is close to100% safe. However, athletes being evaluated still need to run the 40 or in the case of baseball, the sixty. In addition to the obvious injury prevention/ reduction/ avoidance angle, we have always concentrated on the 10 yard dash for the simple reason that the first ten yard segment, the start if you will, is the easiest area to improve. The first ten yard segment, although equal in length to each following ten yard segment takes more than 1.5 times as long to run. This may seem obvious as this is the “zero to sixty phase” of the vaunted forty yard dash. However to really understand the significance it is important to look at some data. When looking at the data one thing immediately jumps out. Both athletes ran from 10-20, 20-40 and 10-40 in nearly identical times. In fact athlete 1 obtained the entire differential in the times ( .11) during the first ten yard segment. Athlete 1 may in fact not be faster, he simply accelerates better. His “speed” is no greater, however his initial acceleration is significantly better. This graphically demonstrates how critical the initial rate of acceleration was in the race. Athlete 1 obviously has less inertia to overcome and as a result accelerates faster but, this faster initial acceleration corresponds exactly to the difference in forty yard dash times. Two important things to note. One, this definitely reinforces my feeling about the importance of the start and of the first ten yard segment. Two, the result reinforces the importance of strength development in improving forty yard dash performance. For athletes under 200 lbs. assume a low of 2.8 seconds and a high of 3.0 seconds added to the 10 time. For athletes 250-350 you can add 3.0 to 3.4 seconds to the 10. In any case, the data clearly shows that working on the initial ten yard segment of the forty yard dash is both the safest and the fastest route to lowering your forty time. No Comments to "The Key to Being Fast"